How do I get Pookatoo on my phone or tablet? To add Pookatoo to your iPhone or iPad, simply open Safari, and type pookatoo or pookatoo.com into the address bar. 1. Tap on the icon with the box and arrow. It may be at the bottom of the screen on an iPhone, or at the top right of the screen on an iPad. 2. Now tap on "Add to Home Screen". 3. The Add to Home box will appear. Tap on "Add". The Pookatoo icon is now added to your phone or tablet. Now any time you want to use Pookatoo, you can simply tap on the icon (Internet connection required). 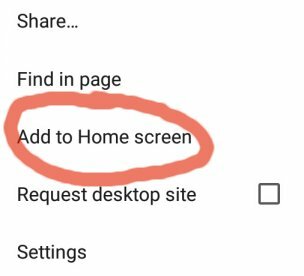 The following instructions are for the Chrome browser on Android. 1. Tap on the Chrome 3-dots options icon. 2. Now tap on "Add to Home screen" from the menu. 3. Now tap on "Add". 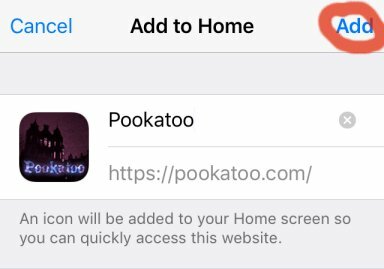 Any time you want to use Pookatoo, you can simply tap on the icon (Internet connection required). Can I get Pookatoo from an app store? No, Pookatoo is not available on any app stores. Please use the instructions above to install an icon for Pookatoo on your device. What phones does Pookatoo work on? Pookatoo will work better on phones with large screens. It will work great on most tablets. The controls may be difficult to use on smaller screen devices - in this case, we suggest using a pinch zoom action to enlarge the screen a little bit. Apart from that, any phone with a modern web browser can be used. How can I use Pookatoo with Whatsapp or other messenger apps? Just save the image file you made to your phone first, then send it as an image in Whatsapp or other apps. You can also send animated text, however we strongly recommend changing the background colour of the text to white for a better effect (see the question How do I change the text background to white? ).